By societal norms, it is easy to pin point the girl and boy focused toy isles in any local Target store. The pink isle is adorned with small Disney Princess dress up clothing, and loaded with barbies, dolls, and pretend make-up kits. The Easy Bake Oven packaging comes in a beautiful pink cardboard, with young girls very intent on their next cooking experience. This isle screams girly, and is almost suffocating with gender stereotyping. Target even goes out of its way to make the actual isle boards a vibrant pink shade. 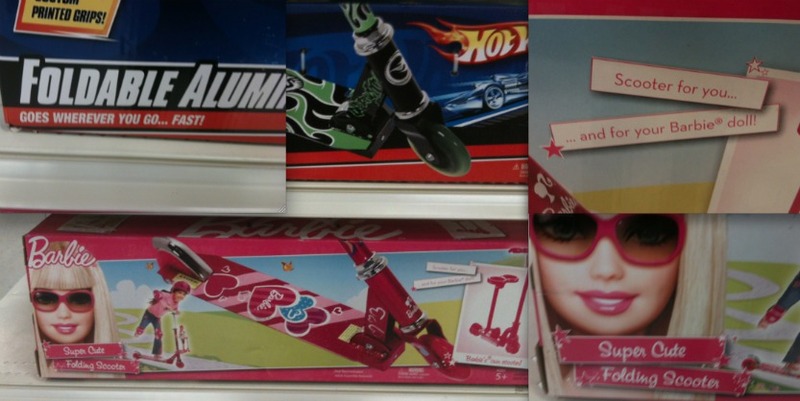 The packaging of the toys states exactly what girls should be doing. They should be young, beautiful and passive as they waltz in their favorite Disney Princess gown. Their activities are domestic, and household oriented. Their role should be submissive, and their focus is on beauty and image. Young girls are told to wear frilly, pink outfits, and aim to model their bodies after the latest Hannah Montana barbie doll. Of course, just two isles down, is another world. This of course, is everything the girl’s isle isn’t. Hot Wheels, Superheroes, Star Wars Legos, and Slime Factories. The packaging is either blue - the dubbed boy color - or pictures muscular men doing strenuous activities. If the actual toy could be categorized by “doll”, the packaging does everything in its power to be anything but that. In fact, any action figure is created in an overly masculine image with bulging muscles and aggressive names. Examining the toy section with a keen eye, we see the advertisements on the boxes themselves proving a masculine versus feminine model. A favorite example found in the isles of Target is the ever famous Scooter. By the basic structure, a scooter is a scooter is a scooter. Whether a boy rides it, or a girl rides it, the function is the same. However, the packaging between two separate scooters would make the toy seem as if it were two different items all together. On one shelf there is a foldable aluminum scooter that loudly advertises Hot Wheels. The scooter itself has black and green flames and the packaging states, “GOES WHEREVER YOU GO…FAST!” On the shelf just below, there is another packaged scooter. However, this box is pink, and states, “Super Cute Folding Scooter. Scooter for you… and for your Barbie Doll!” Of course, the scooter itself is pink, and boasts large, puffy hearts as its decor.